Last week, Chris up in Toronto posted a happiness decision-making flow chart that I thought beautifully encapsulated life’s main lesson. I thought I would share it with you here. I’ve been in meetings this week. My boss, her boss, and one of my colleagues flew into KC to meet with me. I’m flattered that they consider my rare visits to the US important enough to fly to meet me. I’ll be in meetings through Thursday and then will have the weekend off for the family reunion. In the meantime, the nieces wish I would stay home with them. As she left for daycare this morning, Ava looked up at me and asked, “How many minutes do you have to work for today?” Precious. This entry was posted in Uncategorized and tagged Happiness, Happiness Flow Chart, Life by christao408. Bookmark the permalink. lol…yeah, how many minutes do I have to stay at workplace? no too long, eh! 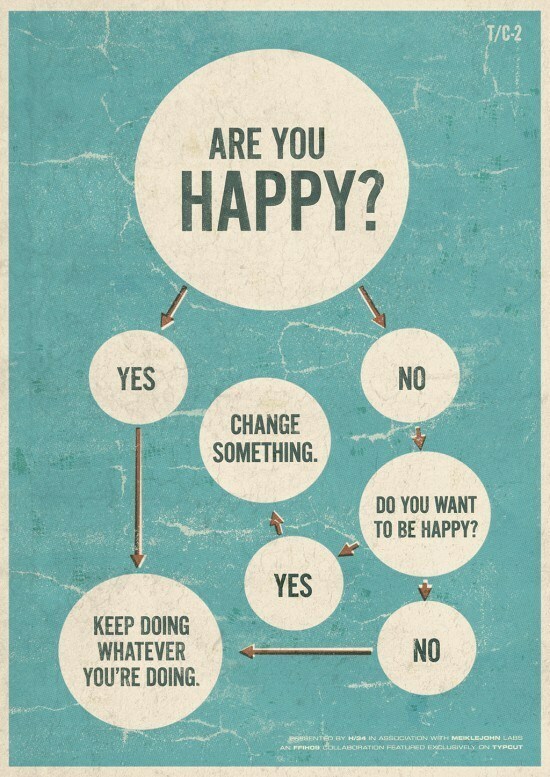 That’s a nice flow chart in that it gets the point across, but rarely are the things troubling us so easily changed! Ah simple, but right on. The flowchart is brilliant. No inclusions for excuses or contingencies, just that kind of “if it matters enough, then do something,” no-nonsense attitude. Heh, I want a poster of this.And that Ava sounds very sweet! wat a lovely chart, simple and to the point! Ava is such a darling! So cute!!! I hope you told her a few zero minutes. She is adorable.Love that chart. You must be their 2nd favorite uncle (I bet Tawn is #1)! hehe! Hope the all day meetings didn’t exhaust you – you’ll need some energy to keep up with the girls! How many minutes? hee hee… that’s so cute. haha, I’m setting this as my desktop background. Right now, the 1st answer is a resounding yes!